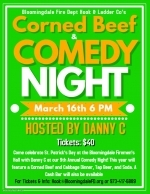 The BFD responded and extinguished a brush fire off Glenwild Ave.
Corned Beef & Comedy March 16th! 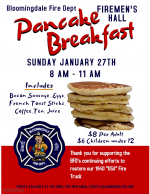 Pancake Breakfast for the USA! 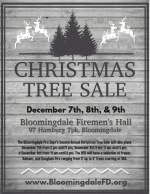 Christmas Tree sales will be December 7th 5 pm to 8 pm, 8th 11 am to 5 pm, and 9th 11 am to 2 pm at the Firemen's Hall. 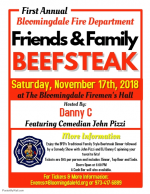 First Annual Friends and Family Beefsteak- SOLD OUT! Thank you! It will be the goal of the Bloomingdale Fire Department, a 60 member all volunteer municipal fire department, to provide high quality and professional fire and rescue services to the citizens and businesses of the Boro of Bloomingdale, with all the necessary safety precautions and training to minimize the risks to it's members; to inspect any and all commercial and life hazard occupancies to prevent fires from starting; to educate it's citizens in the fundamentals of fire safety and to respond when called upon by our mutual aid partners. The BFD trains each Monday at 7:00 pm. Applications for the department are available at Station 1, 190 Union Ave each Monday prior to department training. This site has been viewed 512,657 times.